It certainly is cause for celebration - especially after all we went through to have them. They are miracles. Fact. Of course in the midst of all the partying, I am weepy because my boys are no longer the ity bity tiny babies they were when we brought them home from the hospital. Time sure moved at warp speed this past year! I have loved every snuggle, every kiss, every nap with both babes on my chest, every new discovery, every adorable coo, every waking and sleeping hour - even at 2, 4, and 5 a.m. - I have honestly loved every precious minute!! I thought these sprinkly homemade oreos were appropriate to share on this occasion. Maybe I will share their cakes in a later post. These are not an exact replica of an oreo (not quite as crumbly), but they're pretty close. Everyone who tried them gave the thumbs up! Congrats to your twins! Thanks for the party! Congratulations!!! It is indeed a big day! Have a wonderful birthday celebration! Thanks for hosting! Aw, yay! Happy Birthday to them! That's so great, and these are awesome. Thanks for the party! Happy Birthday to your sweet boys, enjoy every moment with them, they grow up so fast! 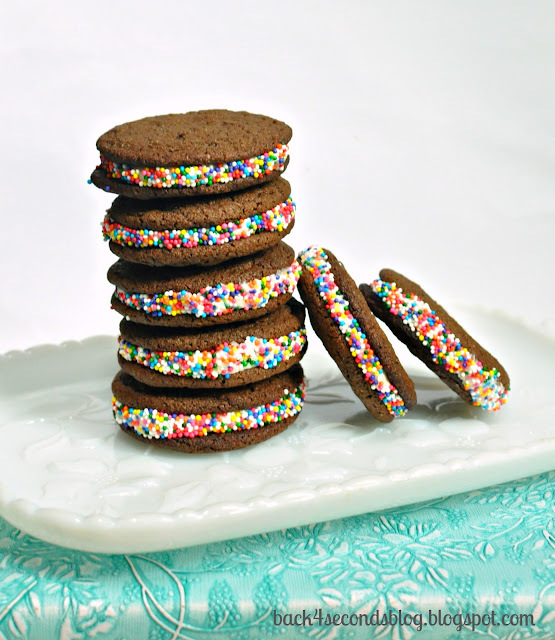 The cookies look wonderful, love the sprinkles. 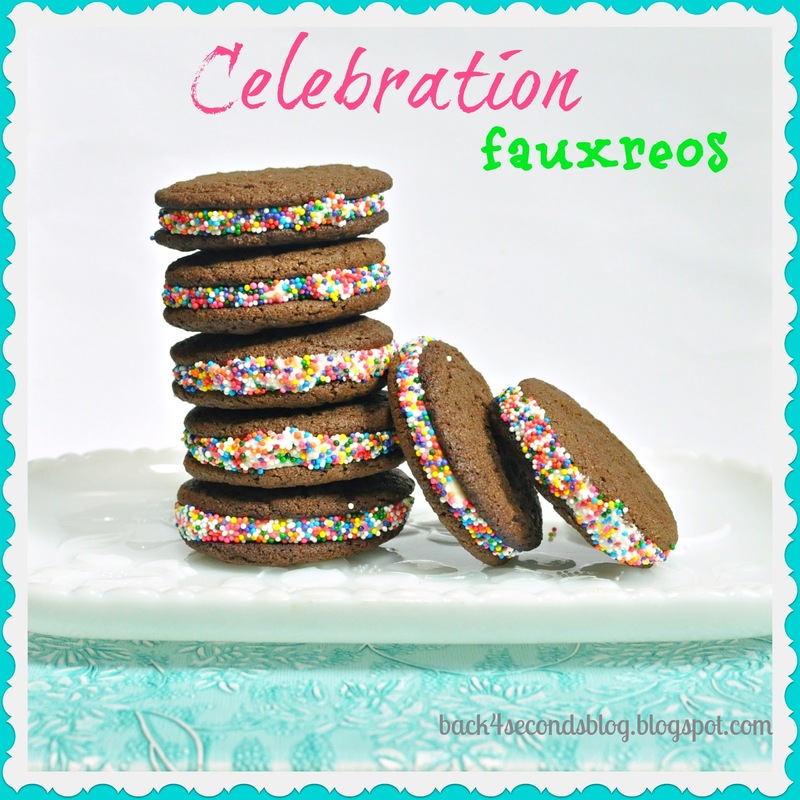 Faux is way better... these are so much prettier than true Oreos! Happy birthday to the little ones! Happy Birthday to your little guys! What a busy year you must have had! Love the oreos! Thanks so much for the invite. Your blog makes me hungry :( Following you from the hop! Happy Birthday to your little guys :) Thanks for hosting. Those Homemade Oreo's look amazing! Have a wonderful week. Happy Birthday to your little guys! Oreos are pretty much a staple in my house; I have to try and make my own one day soon. I wish I had a recipe to share today. I havn't posted a recipe in what feels like an eternity. Hopefully next week I'll be back! Thanks for hosting!! Yummy looking oreos! Happy Birthday to your twins! Thanks so much for hosting this party. Loved your cookie recipe! This is my first time to link up. I'm your newest follower. I hope you'll stop by Posed Perfection for a visit and maybe even a follow back. Thanks for hosting! I originally came over here to check out your home made oreo recipe! LOVE oreos, especially the peanut butter ones. Stephanie! Happy birthday to your baby twins. :) What a miracle, indeed. Sending lots of celebration love your way. :) PS: love love love these "Oreos" !! Happy Birthday to your twin sons!! What a special day!! Children truly are a blessing. :) Thank you so much for hosting this fun party! I LOVE your fauxreos recipe, yum! I hope you and your family have a wonderful weekend! HUGS! Oh so fun! Love your cute blog and these recipes will definitely be bringing me back for more! Happy birthday to your twinsies! Stopping in from the GFC link party and am a new follower! I love these cookies - so fun! Perfect for your celebration - Happy Birthday to the kiddos! These cookies are too cute! & congrats on the twins turning 1!! I know how fast the time flies, mine just turned 2!! Adorable! I would love for you link this up at my first LINK PARTY! such a fun festive party look. The day would have to be special with these on the table. Thanks for sharing on BeColorful. Those look really yummy. I never got to try the dang birthday oreos because for some reason they didn't have them in any of the stores up here :'( I'm sure they won't have the candy corn ones either! GRRR.